I was asked by Greg to bring some fruits for this painting. This is the first time. There're lemons, a pear, a capsicum and an eggplant. I had a hard time to get balance right at the initial wash, and I still have a bad habit of drawing outlines. He showed me how to prioritize and not to draw everything, keeping some edges strong and leaving others soft. 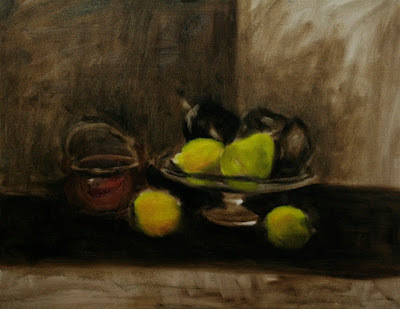 Lemon Yellow is a cool colour, so, when I painted lemons, it looked too cool. He told me a trick is to put a tiny bit of Burnt Sienna to make it warmer. The pear is a cool yellow, so I put Lemon Yellow straight way. It's very interesting to see how these colours play together.